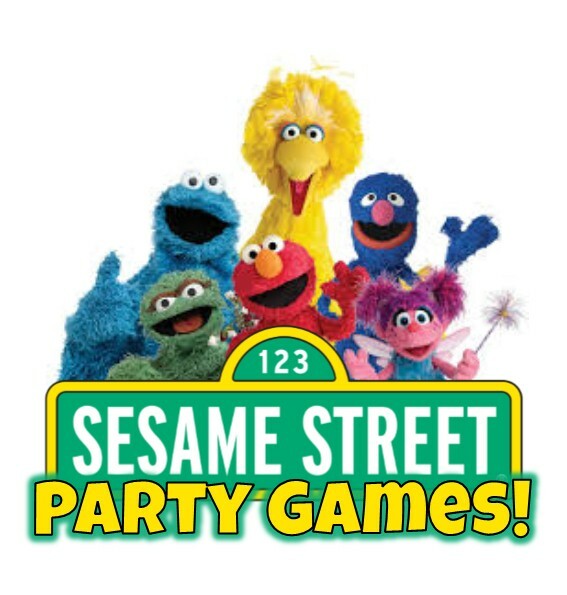 TOP 10 Sesame Street PArty Games! Don't forget to PIn US! 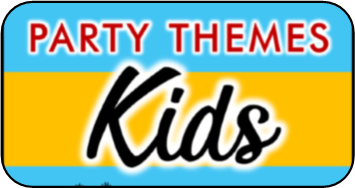 Our Top 10 Sesame Street party games make putting together your child's Birthday bash as easy as A-B-C and 1-2-3. 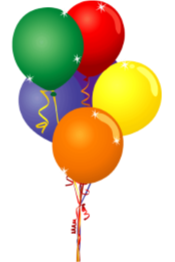 So come on and let us tell you how to make your celebration count! 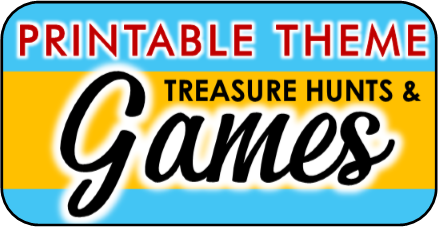 Below you will find our top DIY ideas for activities and games themed around the friendliest neighborhood there is. How to get to Sesame Street. To play this twist on Mother May I, guests line up on one side while one person stands on the other. One person at a time will ask "How do I get to Sesame Street?" The person playing Mother at the other end will answer with a challenge (Ex. You take five steps forward, you spin three steps forward, Cluck like a chicken hop forward one step, etc.). The asker must then replies, Mother May I? To which the Mother replies yes or no. If Mother says no or the child forgets to ask before moving, they must remain where they are. Otherwise they may follow the directions, and play proceeds to the next child. The first guest to make it to Sesame Street wins. I am eating cake and ice cream, I have on a pointy hat, and their are balloons everywhere. Where am I? Answer Ernie is at a Birthday party. Put the strips in a cup. A guest will draw a piece of paper and read the three clues aloud. Young kids can have a parent help. 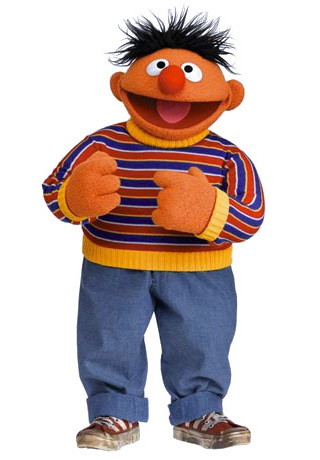 The remaining guests will try to guess where Ernie is. The first person to get it right goes next. For this race you need two giant sweaters. Divide kids up into two teams. Set up a starting line and a finish line. Line the teams up in pairs behind the start line. Have the first pair in each teamput on a sweater (1 arm per child, shared neck). Explain that this is the way the sweater must be worn for the race - you can have a volunteer on each team to help get the sweater on and off. On the start of go teams race to the finish line and back, when the pair gets back to the start line they take off the sweater and pass ot to the next pair on their team. That pair then puts the sweater on a does the same. The first team to have all their pairs complete to race wins. OPTIONAL: For non competitive play you can have all the players on the same team, you would only need one sweater for this version. You could also add easy obstacles such as weaving through cones if you like. 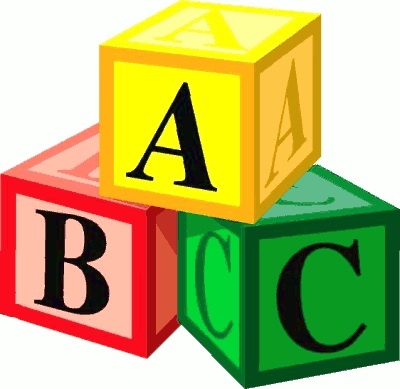 In this game all the kids sit in a circle, in the middle of the circle you place multiple common objects that start with different letters of the alphabet. Such as apple, box, can of carrots, door knob, elephant plush, fork, gumball, hairbrush, iron, jump rope...etc. Have the kids look at all the objects without touching. Go around and touch each child on the head assigning them a different letter. Tell the children to raise their hand when they have found an object that begins with that letter. 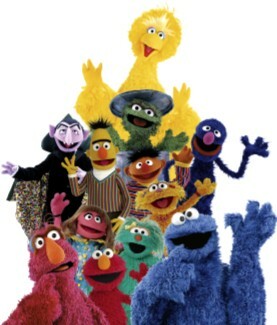 Go around and let each child say " Sesame Street was brought to you by the letter (their letter). I see a (their object) that start with that letter). Give a small prize( a sticker) to each child that finds their letter. OPTIONAL: Call out one letter and the first one to call out the object wins the prize. When Ernie and Bert go fishing, it's an adventure. Ernie calls the fish and they just leap in the boat! Now it's your turn. Assign one parent or older sibling per child. 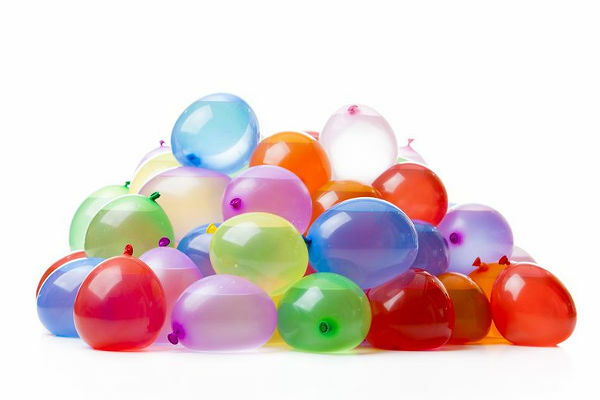 Fill a lot of water balloons for fish. The parent/sibling will kneel across from each child and toss the fish to them. 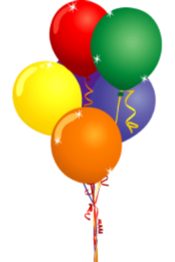 The child must try to catch the fish and put it in a bucket (one bucket per child) without bursting the balloon. The balloons will flip and flop like real fish, making this harder than it looks. At the end, see how many fish each child caught. The child with the most fish wins! Set up an obstacle course for all the kids to get super on. You can have cones to wriggle through, blankets to crawl under, hoops to hop through, wood plank to balance on, pillow forts to make it through without knock over, add a special section where they have to crap walk through or hop on one foot. Ideas for obstacle course are endless. 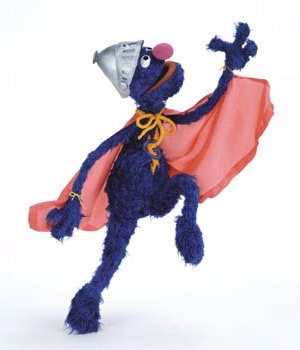 Let each child take a turn putting on a grover like cape and make their way through the course. Award a small prize when they get to the other side and declare them Super (their name). 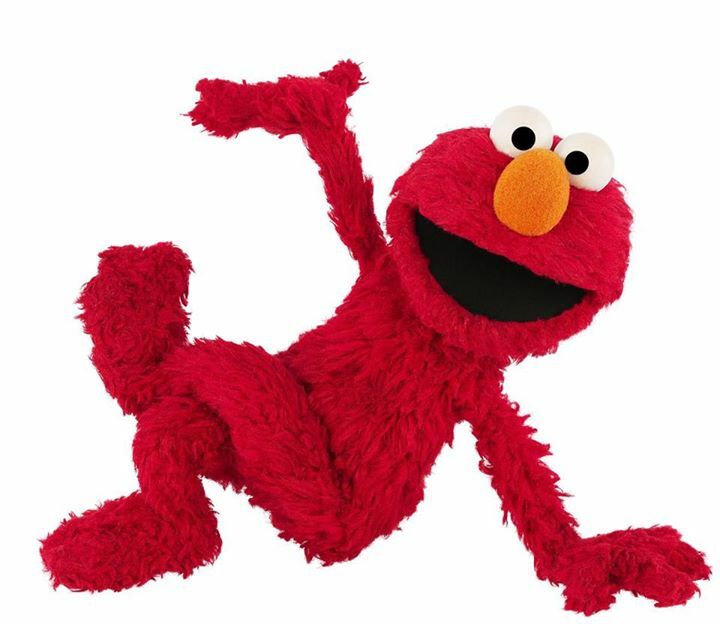 Elmo says touch your toes! 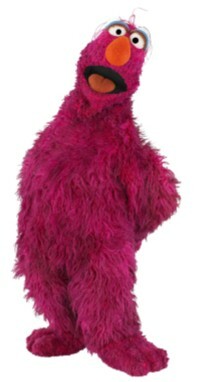 One person plays Elmo. He will do something and everyone must copy, but only if "Elmo Says". If Elmo doesn't say "Elmo Says" first, anyone who copies is out. The last person eliminated becomes the winner and the next Elmo. This is of course, a version of the all-popular game Simon says. This is a great way to transition from games to cake and ice-cream. Telly Monster has a message for Big Bird and he needs your help to deliver it. All the kids will line up. 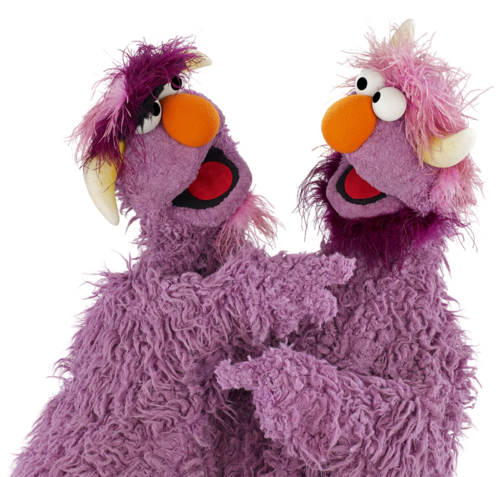 A parent (Telly) starts it off and will whisper a message " Will you join me for some cake and ice-cream" to the first child, who whispers it to the next and the next. They can only say it once. The hearer must do their best to understand what was said and repeat it. 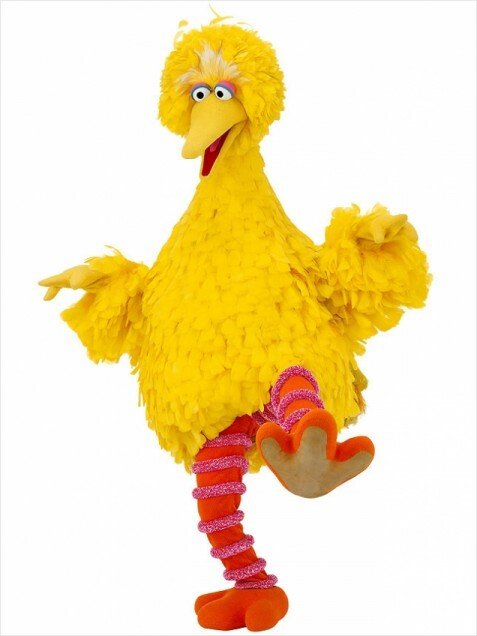 When the message reaches the end, the Birthday child (Big Bird) says it out loud. Did it stay the same? If yes, say "Well what do you say kids - Are you ready for some cake and ice-cream?" said in a very enthsiastic voice you will hopefully get an even more enthusiastic "YES!!". If the answer is different, let everyone have a laugh and then have "Telly" stand up and say in an enthusiastic voice " No I said, will you join me for some cake and ice cream? ".